Horizons Landscape & Irrigation Inc installs all types of retaining walls, paver patios and paver driveways. If you are looking to add to your lawn experience or have an outside area for employees, we can build what you are looking for. We can install small decorative retaining walls to large retaining walls to hold back any hillside that may be eroding away. We use all the major brands of retaining wall blocks, so you will have a variety to choose from. If the manufactured retaining wall look is not the appearance you are looking for, we can also install natural stone outcropping. Are you looking to enhance your back yard or add an employee area outside of your office? A paver patio is the way to go! We can install any and all types of pavers from the cement pavers to clay pavers. You may also want to enhance the front of your home or office with a paver driveway or sidewalk. We are able to install all sizes for the look you are wanting. 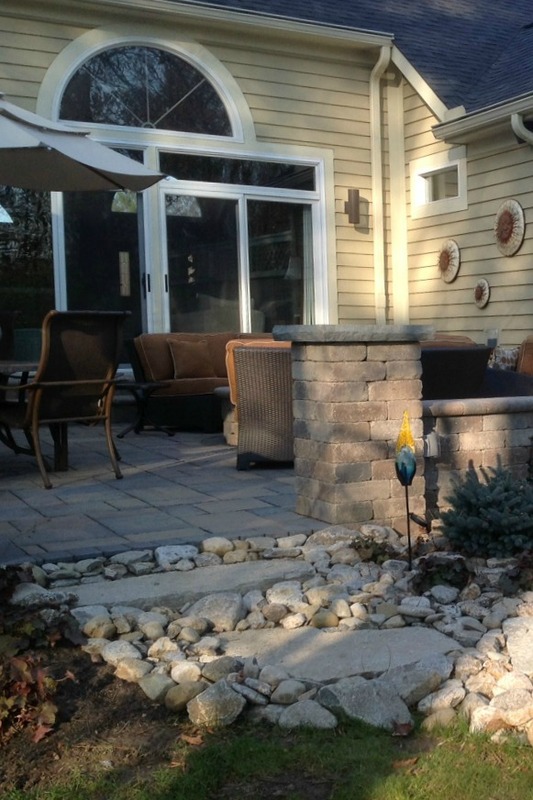 A new paver patio wouldn’t be complete without a fire pit, a fireplace or perhaps a sitting wall next to your patio. Here at Horizons Landscape & Irrigation, Inc., we can bring your back yard to life! Your family, friends and employees will be enjoying some time outside on a beautiful Cincinnati day.